The rest of you, not so much. Fresh on the heels of locking Disney into one of her Food Police cells, the First Hamburglar is off to have some pie. The rest of us can eat our carrots. Dressed like a bag of bulging cotton candy, she was hard to miss although I am sure some tried. Michelle Obama may be a diehard for healthy eating and exercise, but today on a campaign swing through Virginia she wasn’t counting calories. 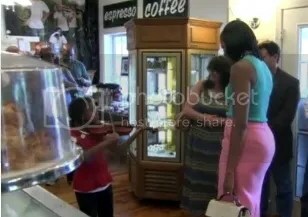 The first lady made an unannounced stop at Mom’s Apple Pie Co., a family-owned bakery in Occoquan, a small town about 23 miles southwest of the White House. Obama also selected two pies from the display case — one apple pie (regular crust, no crumb) and one sour cherry. “I will be killed if I don’t come out of here with pie,” she said with a smile, paying cash for both. President Obama is famously a fan of pie. His favorite is reportedly sweet potato. This entry was posted in Err What?, Michelle Obama, Nanny State, The Articles and tagged FIRST HAMBURGLAR, Food Hypocrisy, Mooch, Pie Trip. Bookmark the permalink.